When I was in Thailand last year, I was lucky to have a full month to enjoy the local culinary specialties. Coming straight from Bali with no issues finding vegan and vegetarian food and some of the best culinary experiences in my life, Thailand was a bit different. I remember from my first stay in Thailand the food was amazing, but that was many years ago and back then I was eating everything, so it was easy. This time in Thailand I noticed that even when something was presented as vegetarian, it turned out to be made with fish sauce or shrimp paste. This meant an additional few rounds on the scooter with a hungry stomach until we found what we were looking for. And eventually we always did! I never miss eating meat. The only thing I miss sometimes is the sense of freedom and surprise of being in a new country and able to try out any new dish. Our food consumption in Thailand was something like this: Pad Thai – Coconut lemongrass soup – Green curry – Red curry – Jackfruit curry – Massaman curry – Repeat. We also ate lots of fresh fruit and coconut ice-cream in between. After discovering an amazing local vegan place, we got a bit more variation. Unfortunately most dishes were too spicy even for me and my hot taste, so I couldn’t eat it too often. As much as it seemed a bit repetitive back then, thinking about those Thai dishes makes me want to go back right now. I mostly enjoyed the curries. Curries are some of my favorite dishes in the world. Especially Massaman curry. 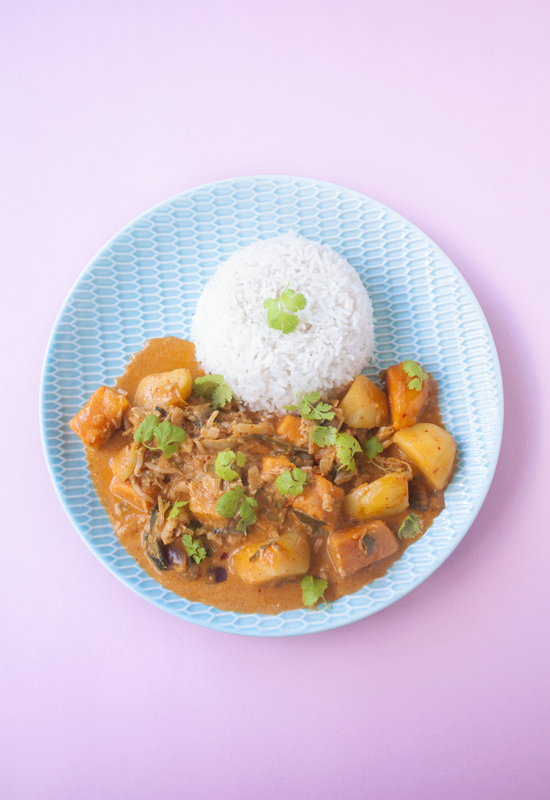 We often make curries and this vegan Massaman curry with sweet potatoes is one of the best. I found a very natural curry paste that tastes amazing. It’s one of the few things in our house that isn’t homemade and while I definitely want to make my own curry paste one day, for now I’m really happy with the ready made one. This delicious dish is rich and creamy with a great balance of sweet potatoes, regular potatoes and mushrooms. ⋅ Chop the onion and lightly fry it in coconut oil until golden. 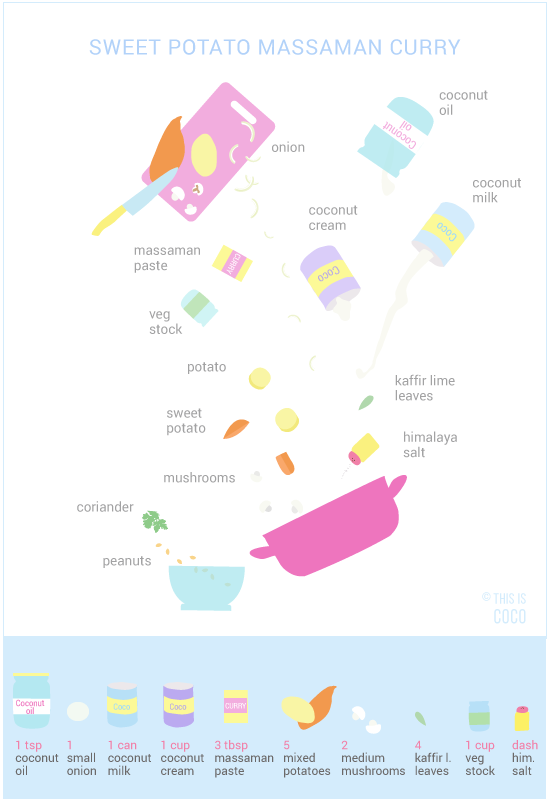 ⋅ Add the Massaman paste while stirring. ⋅ Add the coconut milk and coconut cream and stir until the paste is fully dissolved. ⋅ Mix in the vegetable stock. ⋅ Cut the potatoes and sweet potatoes in squares and add them to the pan. ⋅ Slice the mushrooms and add them as well. ⋅ Add the kaffir lime leaves and salt. ⋅ Cook on a low fire for about 25 minutes or until the potatoes are soft. ⋅ Use 1.75 cup of water for 1 cup of rice. For this recipe I used 3.5 cups of water for 2 cups of rice. ⋅ Rinse the rice well, add to a pot with cold water with a dash of salt and bring to a boil. ⋅ Reduce to low temperature once it boils. ⋅ Cook the rice for about 20 min. ⋅ If your pot isn’t fully air tight; seal the lid with a small towel between the lid and the pan to keep the steam inside the pan. ⋅ Remove the lid and air fork the rice, by turning the rice a little bit to air it. Serve the vegan Massaman curry with rice and fresh coriander. A handful of roasted peanuts is optional. The perfect dessert to go with this Thai classic is this homemade Thai coconut ice-cream.